Soooo, sauerkraut? Yeah, YEAH! Sauerkraut! I’m as surprised as you are that I’m writing about it right now, since up until a week ago I pretty much thought I hated it. I’m sure I’d tried it as a kid — you know the white, limp, salty-as-heck, store-bought stuff? Clearly I’m not a huge fan of it. And I know I haven’t eaten it in at least 20 years. But, last month, I had a purple cabbage I knew I wasn’t going to use and didn’t want to waste. ENTER: SAUERKRAUT. Apparently it’s trendy and good for you and I figured I might as well give it another chance. Right? Right. I’m now 100% obsessed and in love and crazy about it. I’m putting it on my eggs. I’m putting it in my mac n’ cheese. I haven’t yet put it in my mac n’ cheese quesadilla, but I might! I’m making delicious veggie bowls with quinoa and peanut sauce and THIS (keep an eye out for a post on Friday that will blow. your. mind.). I’m eating it straight off a fork. I pretty much feel like the healthiest weirdest person in the world because why else would I be consuming such massive amounts of sauerkraut? I’m gonna need a few more mason jars over here! Here’s the thing: it’s ridiculously easy to make. It keeps for a very long time (thank goodness, because I left it untouched in my fridge while I was in Scotland and Iceland!). 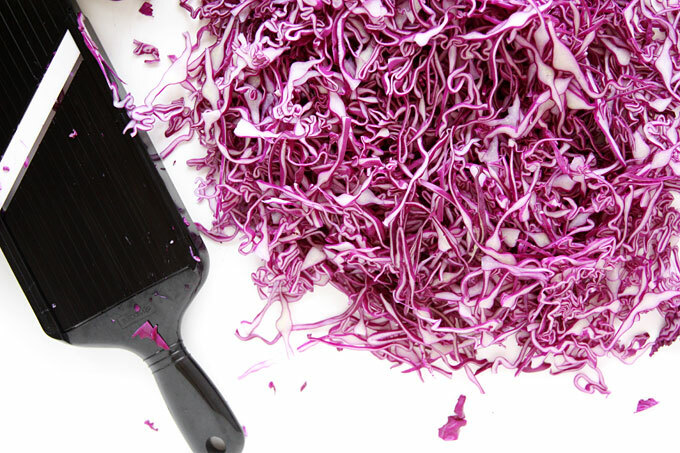 All you do is combine the shredded cabbage — I used my mandolin slicer — with some salt, and start massaging. Get in there with your hands! Eventually, the cabbage releases it’s juices. Put EVERYTHING into a jar and let that baby sit for a few days! In this summer heat, it might not take that long. 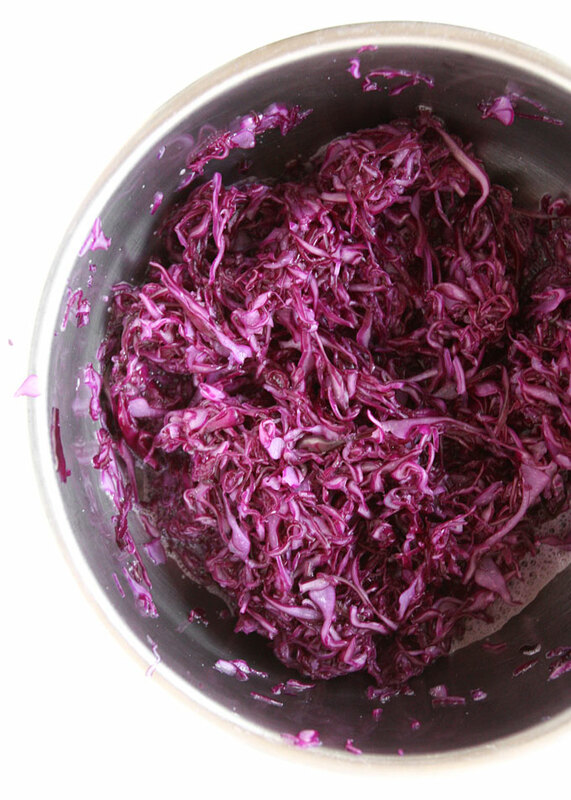 After 2-3 days, you have sauerkraut and you too can be the healthiest human in the world and try not to stain your entire apartment purple. Seriously, be careful. HOW GORGEOUS IS THIS STUFF!? Ooh I love it. 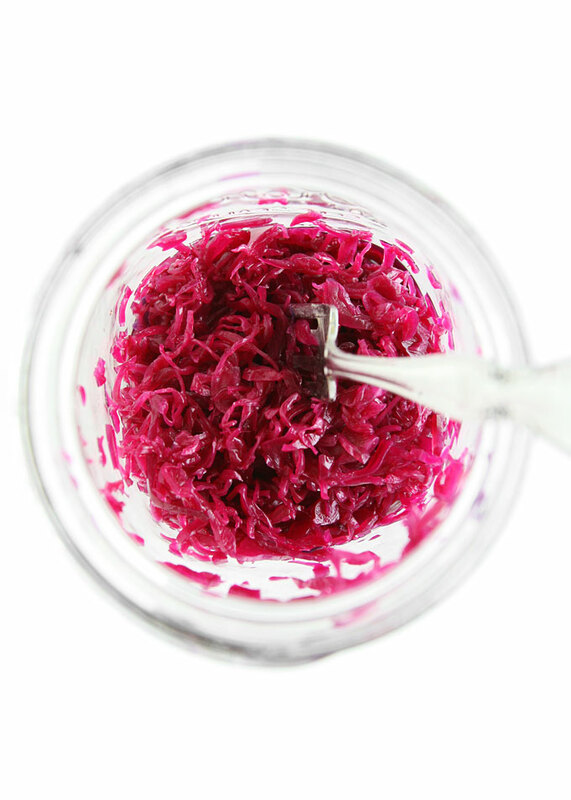 AND it’s not all limp gross like the sauerkraut I have in my mind — it has a little crunch, lots o’ flavor, and PIIIINK PINK PINK. Slash purple. Who wouldn’t love a food that color? Maybe if I eat enough of it my hair will start growing that color… I would not be opposed to that. Oh man sauerkraut. I could eat it by the bottle. 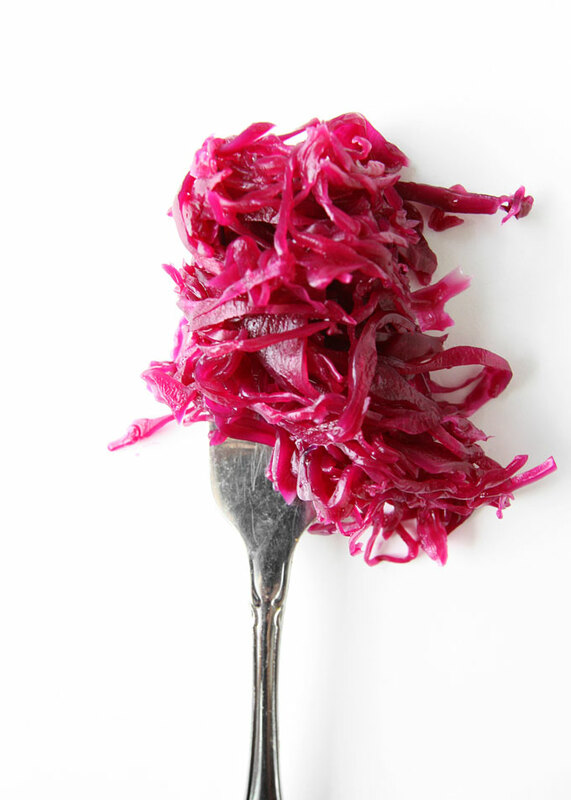 I love the stuff, and especially when it is done with purple cabbage. Looks great! Thanks, Laura! I’m glad I’m not the only one!! That looks amazing. Your photos are gorgeous. Great to meet you through Cathy Chester. Sharing! Oh man, I’ve been meaning to make this. It’s awesome for your complexion, circulation, and according to You Are What You Eat, your libido. Who knew? Well, here I go. 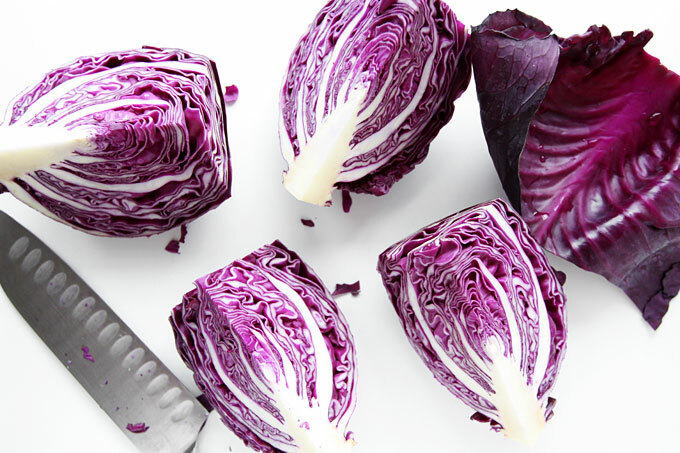 A friend gave us 2 heads of purple cabbage and I am going to tackle your recipe right now. Thanks for sharing. Wish me luck! So, I made this, and, OMG SO AWESOME. This stuff is AMAZING! Thanks for introducing me to the world of homemade sauerkraut. Delighted to stumble on your blog. 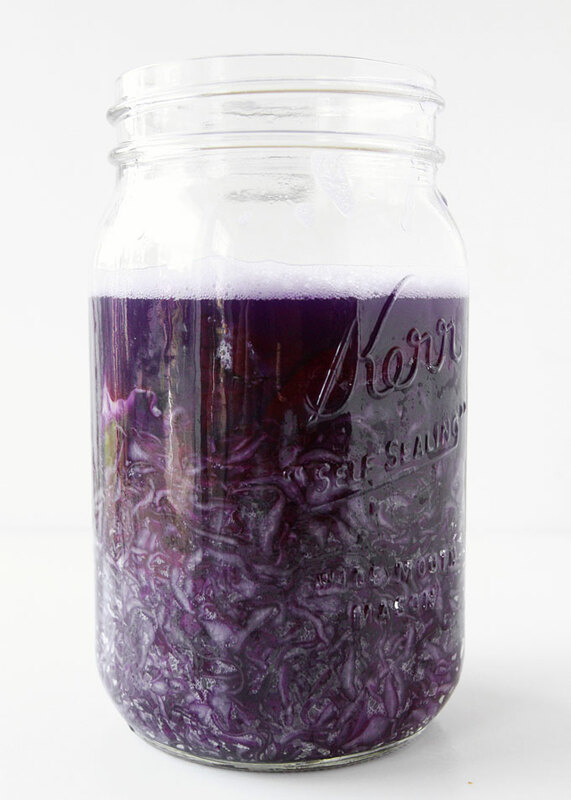 This is a reminder of how much I love purple cabbage and anything fermented. Mine is chilling now. I’m so excited to try this out. 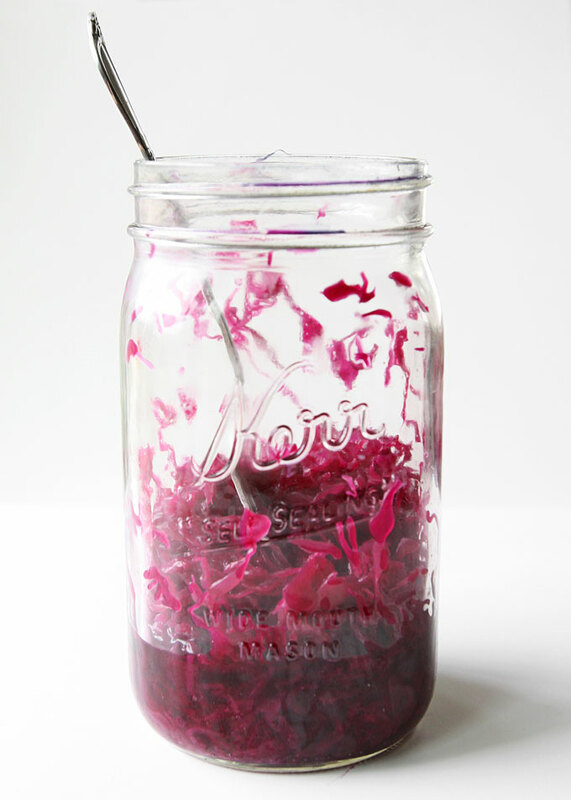 I love homemade sauerkraut but am with you on the store bought stuff. Yuck! I also have to say, your writing is great. I just started a blog and I’m trying to write stuff that people actually want to read. Usually I just scroll to the bottom to read the recipes, but your photos got my attention then before I knew it, i had read the whole post. I was like “woah how’d she do that? !” Wonderful writing! Thanks for the recipe! I’m going to try it tonight!